At the end of the 17th century, Macao - the mysterious port city on the southern coast of China - is a Portuguese trading post in the Far East. The players take on the role of energetic and daring adventurers. Many exciting tasks and challenges await the players, whether they are a captain, governor, craftsman, or scholar. Those who chose the wisest course of action and have the best overall strategy will earn the most prestige at the end. One player rolls six different-colored dice, then each player selects two of those dice (possibly the same ones chosen by opponents), then places cubes equal to the number and color of the two dice on a personalized "ship's wheel". For example, if a player chooses the blue die that shows a 5, he places five blue cubes on the ship's wheel position five spots away from the current round. (A player can never claim more cubes than the number of remaining rounds). 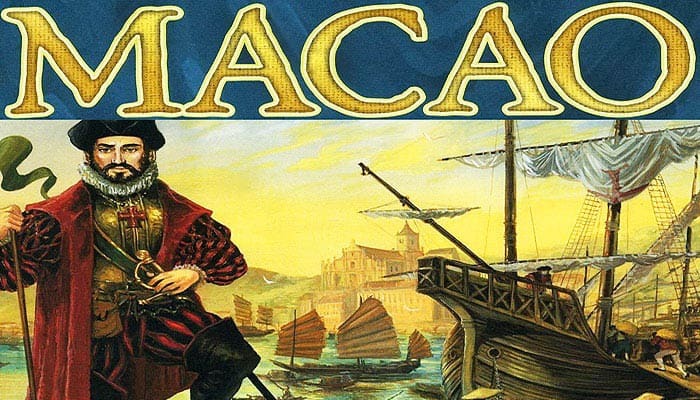 Macao is number 13 in the alea big box series, with an estimated difficulty on the alea scale of 6/10. 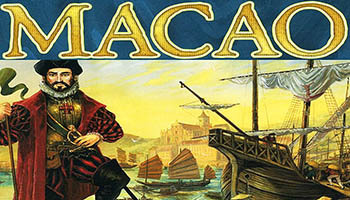 The players take the roles of influential Portuguese adventurers who risked it all in the 17th century to try their luck in Macao, the trading center in the far east of the time. By the lucrative trade with Europe, well-planned expansion in the city, and skillful filling of important offices and positions the players increase their reputation and prestige. At the top left, the card displays the exact number and colors of AC a player must pay to activate the card. The activation costs vary between 1 and 4 AC in all possible color combinations. At the top right is a graphic which indicates the kind of card this is: office, building, or person.